On July 6-7, more than 170 people died and 35,000 were injured or lost their property [ru] in the floods in Krasnodar region (photos and video in these PublicPost reports [ru] - Day 1, Day 2, Day 3). The death toll is likely to grow, as rescuers and emergency services continue their work in the affected areas. The hardest-hit town is Krymsk: water rose to over 3 meters there within minutes and late at night, when many people were asleep and did not have time to escape. In the blogosphere and on the ground, there is no consensus as to what caused the Krymsk catastrophe. Some claim it was a natural disaster; others for a while believed the water in the nearby Neberdzhayevskoye Water Reservoir had been released towards Krymsk in order to keep the port city of Novorossiysk from being flooded; and there are also those who blame the tragedy on the unfortunate combination of extreme weather conditions (about four monthly norms [ru] of rainfall within one day), the unsatisfactory state of the reservoir, the town's vulnerability due to its location at the foot of the mountains and with several rivers nearby, and the authorities' failure to warn and evacuate the residents. Most of these online discussions are politicized, too: bloggers who subscribe to the view that there was no human factor involved in the disaster are clashing with those who hold local and federal authorities responsible for deliberate actions and negligence that, in their opinion, resulted in severe damage and numerous casualties. Official statements have been inconsistent, and a lot of people, both online and in the affected region, are not convinced by the messages that the authorities are trying to convey. The blogosphere hasn't been the most reliable source, either: many bloggers were basing their theories on the information that later turned out to be false. The Neberdzhayevskoye Reservoir, for example, does not have floodgates, so the authorities could not have opened them to let the water out; there is a mountain range that separates Novorossiysk from the Neberdzhayevskoye Reservoir, and its waters couldn't have flown towards the city; the other reservoir, Varnavinskoye, mentioned in some of the earlier post-disaster blog posts as a possible source of flood water that hit Krymsk, is located at a lower altitude than Krymsk, not above it. All this adds to the general confusion and makes it even harder to understand what really happened in Krymsk. As Masha Gessen wrote on the New York Times' Latitude blog, "Thus in addition to the tragedy of the people who died in Krymsk, there’s the tragedy of having no hope of ever knowing what really happened to them." 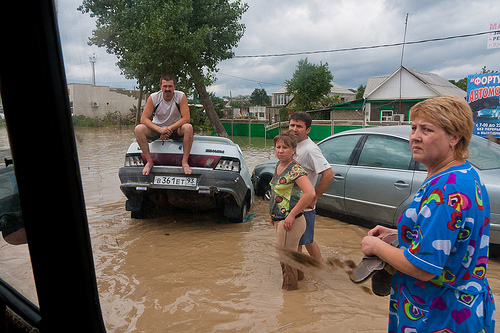 Flooding in Krymsk, Krasnodar region, Russia. Photo by Vladimir Kotelnikov (Flickr user Kotelnikov). Used with permission. A number of bloggers have analyzed the situation, drawing on the photos, maps, infographics and other data available. [...] This [the Reservoir] is not really a bathtub, it's a swimming pool 50x50 meters with a drain opening [the size of] that of a bathtub. [...] How can you build a city and not inform the people living there? And they live there until the first serious rain in the mountains. A normal water reservoir has to be constructed, with a normal drainage system, and a canal bypassing the city has to be dug out in case some overflows occur [...]. [...] I drove up along the rivers Bakanka and Neberdzhay, as far as I could. Came to a conclusion that the release of water from the Neberdzhayevskoye Reservoir could not have been the cause of the flooding, even though the locals support this version. Water level was up in all the tributaries of the Adagum River, not just in the Neberdzhay River, on which the Reservoir is located. I became curious about the reasons of the flood in Krymsk. Things written by "the opponents of the regime" and by "the defenders of the regime" are turning into a crazy mix of [deliberate disinformation], lies, meaningless as well as real facts. So let's just count [...]. Moral #1. With water inflow of 3,000 cubic meters per second and water outflow of 500 cubic meters per second - Krymsk was doomed to sink. Moral #2. There was no wave or tsunami. But there was a rather quick flooding of up to 5-7 meters high - as in a bathtub whose drain opening is ten times narrower than the entry opening. Moral #4. Neberdzhay gave us 65 cubic meters per second, but Krymsk was getting over 1,000 cubic meters per second. The rest of it came from the unblocked streams and rivers [...], which carried all the water [...] into the plains [...] and into the Adagum River. Moral #5. The flooding alert system has to be different from what it is now in the places like the Black Sea coast of the Caucasus (and it appears that there was almost no warning). Moral #6. When you live in an area that allows more water in than out - you must listen very carefully and know how much [precipitation] has fallen on the mountains above you. I think that, most likely, they simply failed to give warning to the residents in #krymsk, treated it as [something unimportant]. That's why so many died inside their houses. While some RuNet users are trying to figure out the cause of the tragedy in Krymsk, others are either on their way to the affected region or already there, as volunteers or journalists. Much of the current online discussion focuses on the relief effort, too. On Twitter, hashtags #крымск ("Krymsk") and #поможем ("let's help") are being used, and among those tweeting from Krymsk and the surrounding areas now are Miriam Elder (@MiriamElder - en, ru), Konstantin Dikhtyar (@konstantinmsk - ru), Suren Gazaryan (@Suren_Gazaryan - ru), Roman Pereverzev (@RomanPomych - ru), Danila Lindele (@dlindele - ru), Alyona Popova (@alyonapopova - ru), Ilya Ponomarev (@iponomarev - ru), Anastasia Karimova (@aakarimova - ru), @Cockroach_brain (coordinates volunteers; her July 8 photos from Krymsk are here - ru), Dmitry Maletin (@eMaletin - ru). Some of the citizen media tools, platforms and initiatives [ru], whose goal is to coordinate the relief effort, are: the Ushahidi-based Kuban/Krymsk Help Map (launched by RuNet Echo's Gregory Asmolov); the Floods sections of Rynda.com (Virtual Alarm; a GV text about this initiative is here); krymskhelp and this post on Krasnodar Live! on LiveJournal; Facebook groups "Help for Kuban" (1,333 members) and "Aid for Victims of Kuban Floods" (606 members); VKontakte communities - here (583 members) and here (4,637 members); this message board at Kuban.ru.